Home > STEM > Can Heading A Soccer Ball Be More Dangerous for Women Than Men? The clock is running, there are thirty seconds left in the game, and the ball is speeding towards your face… what do you do? You can’t let your team down and use your hands; your red card may cost the team the winning goal! Your best option is to perform the move of “heading” the soccer ball right into the net! In both men and women’s soccer, heading the ball is a very common activity for players to perform. In fact, many will put their head to the ball without a flinch of pain. However, hurling your head towards a soccer ball can do more damage than you think, especially if you’re a girl. Soccer headers can damage the brain’s white matter, which consists of the routes for transferring information and signals throughout the brain. A concussion occurs when the white matter of the brain stretches out and rips. 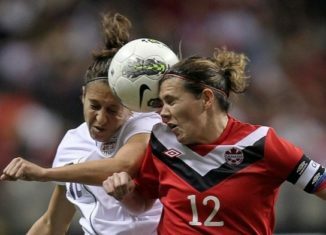 Although one soccer header will likely not cause a concussion, repeating the action over time can lead to long-term injuries. Dr. Michael Lipton is a professor of radiology and psychiatry at the Albert Einstein College of Medicine. In 2013, he led a study to see the difference in the damage of white matter between the brains of male and female soccer players. Lipton’s team made sure to stay away from self-reported symptoms during the experiment as self-reported symptoms can increase the difficulty in diagnosing a brain injury. Many other studies claim that women are more open to sharing their symptoms than men are, which may explain why it has been noted that women cope with head injuries worse than men. Consequently, Lipton’s study used brain scans to measure changes in brain tissue to determine the truth about this controversy. Specifically, he used diffusion tensor imaging, an MRI-based neuroimaging technique which makes it possible to estimate the location and orientation of the brain’s white matter tracts. Lipton selected 49 men and 49 women, all of whom had no history of head injuries and played in amateur soccer leagues. They were asked questions such as how often they headed the ball and the setting they did so in. After the diffusion tensor imaging of all volunteers, the results were ready to be shared. The results of Lipton’s test showed that headers take a greater toll on the female brain than the male brain. On average, the female brain had eight regions that showed signs of white matter damage, while the male brain only showed three. Heading a soccer ball may be more dangerous than people originally thought. That doesn’t necessarily mean that this soccer technique should be prohibited. There is still no declared number of soccer headers that is considered to be “safe”. Soccer players can handle heading to some degree, however, this degree definitely needs a limit. There is still a long way to go before the science behind heading a soccer ball can be concluded.